We are 10 days away from St.Patrick's Day, so we decided to honor it by showing you the different shades of green in the kids rooms and baby nurseries. I'm not sure who the author is, but he/she certainly deserves the accolades. Have you ever wondered why Nature is so green? Is it a color that soothes the eye? Is it a color that gives you peace and serenity? The Different Shades of Green! So which is your favorite color? Check out these rooms and find out for yourself. 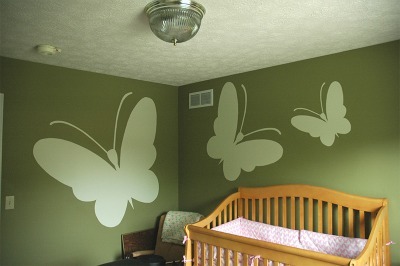 Giant butterflies painted a lighter shade of green stops the room from becoming to dark and dreary. 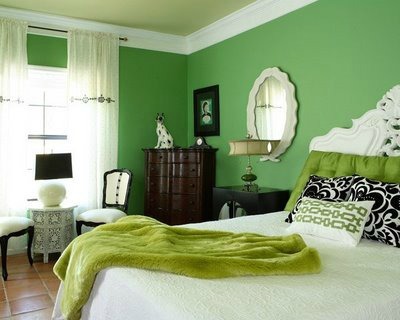 A gorgeous shade of green but maybe rather dark for a small room, although here it is perfect. 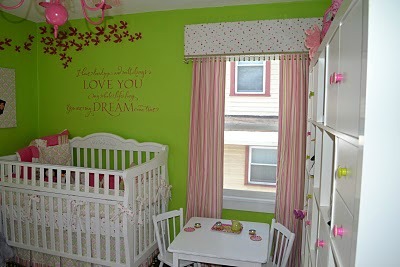 Take a chance on this bright lime green baby nursery. Adding pops of pink and white make the green look even brighter. If a color is too bright or too dark for you to cover the entire wall, consider stripes. You don't have to stick to wall colors. Why not accessorize with green beddings, valances, rugs and more. 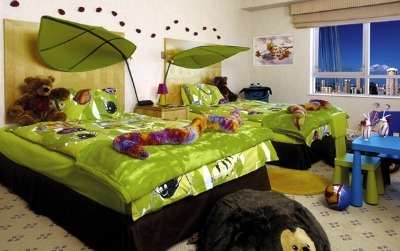 My kids would love to have a room like this since they are such nature lovers. I think this picture is definitely going into my decorating dream folder. Absolutely Adorable. We couldn't find the link for this amazing green room. But I love love love the big eyes looking al around in wonder. The pastel shade of green is very soothing too. Orange You Happy with this Green? Green is the color of Nature. Which translates to it being able to hold it's own with any other color. Use it with blue, pink , grey or orange. With green you just can't go wrong. Teenagers, find this awesome shade and add pops of black. Epic! A boy's true love of soccer can be shown in more ways than one. 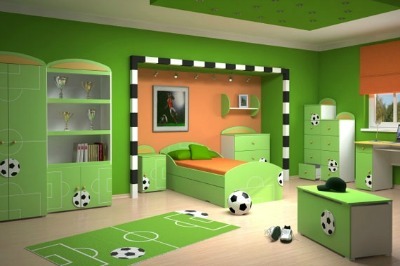 Decorating kids room in their favorite interests will always be a big HIT!